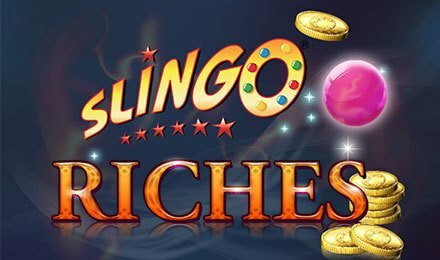 Play Slingo Riches: The Slingo Game with a £20k Jackpot! Slingo Riches is a Fast Paced Slingo online game that is also one of the top games in this genre. This game is a favourite with both beginners as well as old hands because of the straight gameplay as well as the possibility of winning that £20,000 jackpot! Game Layout: This game is based on traditional 75-ball bingo combined with slots. So, when you complete your Slingo login and enter the game screen, you see a 5x5 grid that is set atop a slot reel. On the left is your pay table, which gives you the value of your prizes and on the right of the screen is the number of spins you have available. For each game, you get 11 spins. If you are unable to complete the game or want to win more, then you need to buy extra spins with real money. Remember, the pay table will change depending on the size of your bet. The minimum bet is 50p and the maximum bet is £100. So, if you bet the maximum and you get a full house, you walk away with the £20k jackpot! Gameplay: Set your bet. Remember, once you set your bet, it will stay the same for the next 11 spins. You can’t change your bet mid-game. Start the game by pressing SPIN Cross the numbers that appear on the reel from the grid above. The object of the game is to win a Slingo. To do so, you need cross out straight lines on the grid – rows, columns or diagonals. You win the jackpot if you cross out all the numbers on the grid, that is, you get a full house. SLike other Slingo games, Slingo Riches also sports those special symbols that help you complete the game and push up your wins. The Joker: A special symbol that gives you the chance of cross out any number in the column it appears. The Super Joker: A special symbol that you can use to cross out a number anywhere on the grid. Tip: Use the jokers thoughtfully so that you can maximise your chances of getting a Slingo. Look at where on the grid you should cross out a number so that you have the greatest possibility of winning this game. Free Spins: You can win free spins that can help you win the game. You can use them after you have finished the 11 spins that you got when you started the game. Coins: You get instant cash wins during the game. These coins are added to what you have already won. The Devil: This nasty fellow can steal away up to 50% of your wins, so be careful of him. Slingo Riches doesn’t have any bonus rounds. But don’t be disappointed. The game’s betting system is designed to let you choose how much you would like to win. So, when you play Slingo Riches and if you choose, say, the minimum bet of 50p and you get a full house, then you get a cool £100 pounds. And if you want to be more daring and decide to bet the maximum of £100 pounds, play hard. Because you can end up winning a massive £20,000! If you want to increase your winnings, but have run out of spins, you can buy a limited number more. However, you will need to increase your bet to carry on playing. Get ready for a fast paced bingo slots combo that will rock your world! Win cash prizes when you match numbers on the reel to the numbers on the grid – it's simple to win riches! Aim for positions that cover multiple directions, like the center square which is included in horizontal, vertical, as well as diagonal lines. These will get you farther than positions that are not included in multiple Slingo lines.